Flight plans in these sessions can be created using !F in chat but pilot assistant gives you a neat graphical interface. If required it will also look uper a real route for you. The latest version of Pilot Assistant can be downloaded from here. 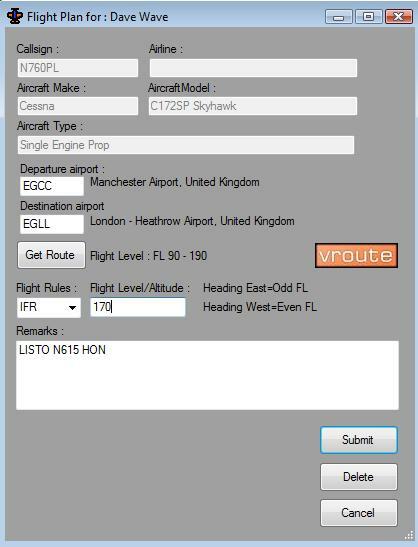 27/11/12 1.34 Flight plans now work if you're on the same local network as the server. 27/11/10 1.21 Improved speed, correction with winds aloft data. Contains auto update code for future releases. 17/11/10 1.20 Weather engine much improved. 5/11/10 1.19 Winds aloft data added to FSopen weather. 31/10/10 1.17 Added FSopen Weather engine. Tabbed layout and help added. 18/10/10 1.16 Small fix that only affects new users at registration fix. No need to upgrade from 1.15 if installed ok.
13/5/10 1.15 Just fixed a bug where using a language like Dutch would make the app think Birmingham airport was the other side of Pluto! This will only work if you are logged onto the main fsopen session. Also I've decreased the rate of turn on pushback to something a bit more realistic! Start a pushback as normal then hold down keys 1 or 2 to turn left and right as required. On release the plane will try to straighten up again so use carefully. 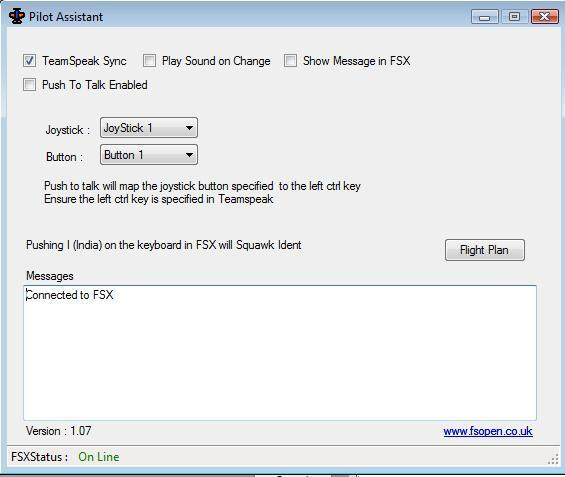 Code added to detect and handle FSX crashing. 23/1/10 1.09 Change to tab order on flight plan. Routes now taken via xml not html hack. 17/1/10 1.08 Remembers userid from last logon for people with memory lapse (Dames). 16/1/10 1.07 You can now get routes direct from vroute database. Pressing I (India) now squawks ident. Added improved error handling for connection issues. 11/12/09 1.06 Added push to talk operation with your joystick.